Trapezodial sheet made of corrosion protected steel for floor anchoring of the "OKF" freestanding installation. The mounting triangles are fixed on the trapezodial sheets by use of clamping brackets and rivets. 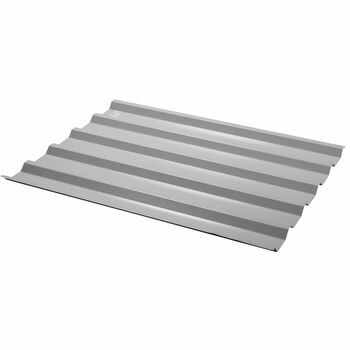 Depending on the type of installation (vertical or horizontal) and the size of the collector field, the trapezodial sheets and mounting sets have to be ordered separately. Due to the positioning of the supply and return connections, horizontal installation has to be carried out as an individual unit.